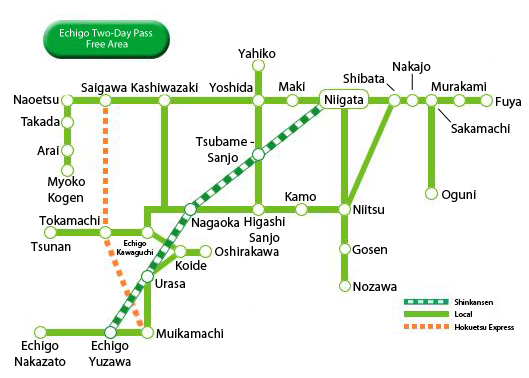 The Echigo Two-Day Pass (越後ツーデーパス – Echigo Tsū Dē Pasu) is an all-you-can-ride ticket that can be used on all local JR lines throughout Niigata Prefecture. It also covers Hokuetsu Railway’s Hokuhoku Line, a privately owned line running from the Yuzawa Onsen area to Naoetsu City along the Sea of Japan. For ¥2500 (¥1250/children), it can be used for two consecutive days on local and rapid trains only. Shinkansen and Limited Express trains cannot be used with this pass. There is a similar ticket called the Echigo One-Day Pass, which as the name suggests, can only used for one day. A major difference between the two is the coverage area. The One-Day Pass is restricted to only the central and northern parts of the Prefecture, whereas the Two-Day Pass covers the entire prefecture. There are even some lines that allow you to trickle into neighboring Fukushima Prefecture for a few stops. But is the pass worth it? I believe so. First of all, many people don’t realize it, but Niigata is HUGE. In fact, it’s the 5th largest prefecture in Japan. If you were to travel by local train from Naoetsu in the south to Murakami in the north, that trip alone would take between 5 and 6 hours and cost ¥3260. If you really wanted to see most of Niigata and take your time, the Two-Day Pass is one of the most economical ways to do so. In addition (I see it as a bonus, really), the pass also allows free bicycle rentals from many stations. So you can get off somewhere, rent a bike for free, ride around a bit, take a dip at a local hot springs (for example), and then reboard the train to your next destination. I don’t think Niigata Prefecture can be done in just one day, so this pass gives you the flexibility to explore a beautiful part of Japan at your own pace. Finally, I’ve included a few links below to help you get started on sightseeing ideas whether it’s your first time to Niigata, or you live here. Enjoy! Niigata Travel Guide – A well done booklet covering tourism activities around the Prefecture. Also provides example itineraries. One of the most comprehensive travel guides (in English!!) that I’ve seen so far. Also appears to be new. Enjoy-Niigata – From the same people who brought you the guide above.